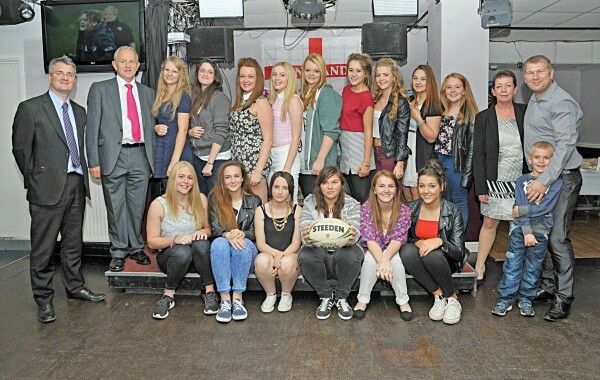 A new rugby club for girls in Kippax celebrated a great first season along with local Councillors. Councillors James Lewis, Mary Harland and Keith Wakefield (Labour, Kippax & Methley) provided £200 towards the end of season celebrations held by Kippax Kangaroos, a girl’s Rugby League club set up in February this year. The new club, based at the Kippax Welfare Sports and Social Club, currently have under-12 and under-14 teams. The girls have had a great season and Councillors Lewis, Wakefield and Harland were happy to have been able to fund their awards night which included a DJ, food and other entertainment. Awards for Club Person, Most Improved Player, Players’ Player and Coaches’ Player of the Year Awards were granted to Brogan Herbert, Charlotte Milner, Abbey Burton and Jasmine Hazel respectively. The Kippax Kangaroos, who practice on Wednesday evenings, are looking for new players and coaches, and anyone interested should get in touch.